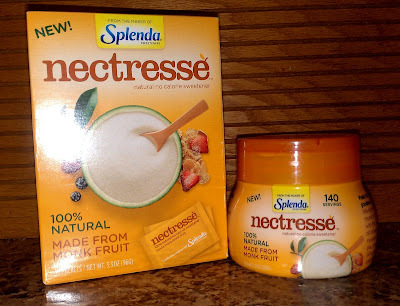 There is no bitter after-taste, and my husband has no idea that I've been using Nectresse in his iced tea instead of sugar! Want to try Nectresse zero calorie sweetener before you buy it? You can get a free sample and a money saving coupon for a future purchase! Available in two convenient sizes; 140 Serving Canister and 40 Count Packets. My husband loves drinking sweet tea and this looks like it would make a great substitute! I've always been a sugar girl. I just try to make sure I have it in moderation. I can't get behind sugar substitutes. I've tried some of this before, and it wasn't bad. I'd like to try it and see how it does in baking! I've heard of monk fruit but never tasted a sweetener made from it. Sounds like a good alternative to sugar. This has become my favorite sweetener for my coffee! Great product. I love natural sweeteners as opposed to man-made ones. I'm glad to see Nectresse is natural! Next to honey, I like to add the natural sweetness of stevia to my drinks and meals, so I think Nectresse would be a great fit. I'll have to try that sample! Thanks for the coupon and the post! I've never tried anything else besides splenda. But my body does NOT like it! Well, my favourite sweeetener is Stevia as it is made up of natural leaves and it is easy to consume. My favorite is definitely honey, I eat lots of it. I've actually thrown around the idea of having my on colony in the yard! I don't really have a favorite sweetener. my favorite sweetener is honey! I love all the different flavors and the health benefits of using honey!